Solar thermal plastic molding is unique among ‘green’ manufacturing processes in that it is economically competitive with traditional plastic molding without subsidies. 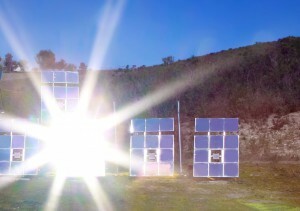 Solar thermal molding uses concentrated solar thermal energy from a heliostat array for heat. This heat beam replaces energy inputs from fossil fuel sources. The heat beam can be refocused from target to target. This allows for simplification of the molding hardware, and large total equipment cost savings compared to the traditional process. The result? Lower initial investment, lower total capital costs, AND lower ongoing operating costs – competitive sustainable manufacturing, no subsidies required.